Talkgroups may have any number of users assigned to them. The following procedure lists one possible way of adding users to a Talkgroup. You can also add users by editing a Talkgroup. Note: This procedure assumes you have already created Talkgroups and Users. In the main menu click Talkgroups. 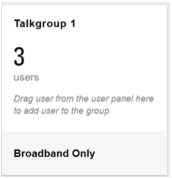 In the Users list on the right side of the page, select the Users to add to an existing Talkgroup. To select multiple users hold down the CTRL or SHIFT key while selecting. 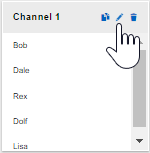 After selected the Users to add, click and drag one of them to the desired Talkgroup and release the mouse button. All selected Users will be added. 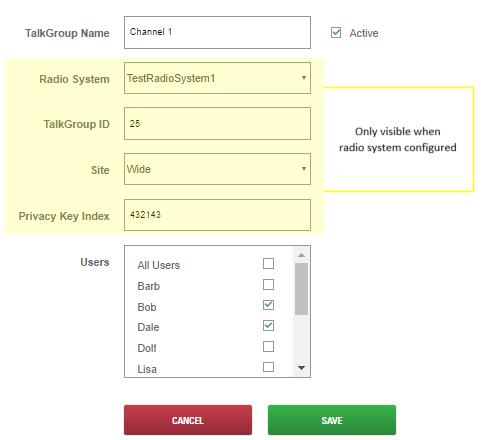 Note: If you mouse-over a Talkgroup, it will display the users assigned to the Talkgroup as well as additional controls for editing, deleting, or duplicating the Talkgroup. 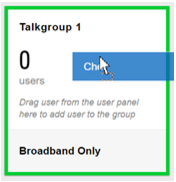 You can also edit the Users in a Talkgroup via the Users list in the Edit page of any Talkgroup. Simply click the Edit icon in the any Talkgroup. In the Users list, select the Users you want to be members of this Talkgroup.